QUICKTHORN (Crataegus monogyna) (Hawthorn, May, Whitethorn). Hedging Plants, Trees, Shrubs and Conifers. Native hedge covered with small flowers in May. Fast growing, very thorny native deciduous plant, tolerant of wet soils. 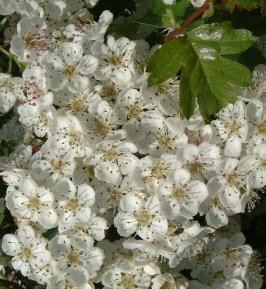 Dark glossy green leaves, clusters of prominent scented white flowers in May followed by small red haws in autumn. Quickthorn makes an excellent hedge with a long season of interest, or it can be grown as specimen tree, as it is very hardy and is useful in coastal or exposed positions. For more spectacular varieties see Cockspur Thorn, Double Pink Thorn or Double Scarlet Thorn. HEDGE Trim between July and March. For hedges 3-20ft (0.9-6m). Plant 9-12ins (23-30cm) apart or for a denser or stock-proof hedge plant in a staggered double row with 15ins (38cm) between rows and 18ins (45cm) between plants. TREE 25ft x 15ft (7.6m x 4.6m) in 20 years, ultimate height 45ft (14m).